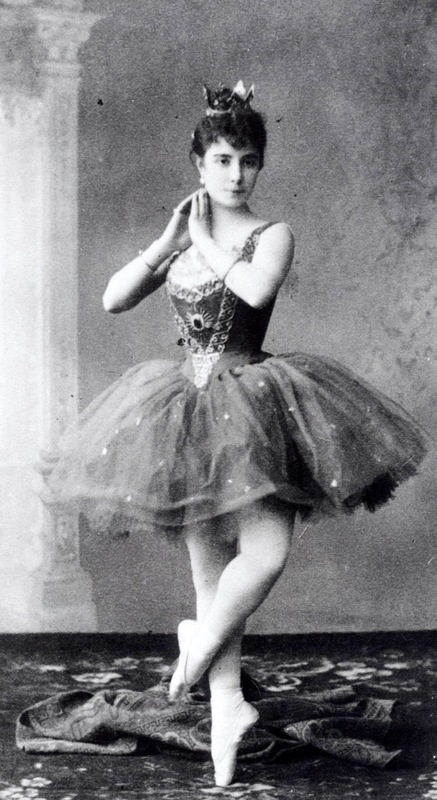 Carlotta Brianza, the first Aurora in Petipa's Sleeping Beauty. Within the Humanities, the term adaptation is usually linked to film studies, in that it focuses on the transposition of a literary work, usually a novel, into a film. Film Adaptation, then, studies what happens, on many levels, to a story when the medium changes. More broadly speaking, Linda Hutcheon defines it as "an acknowledged trasnposition of a recognizable other work or works" (2006: 8). Dance Adaptation is a relatively unexplored field in Adaptation Studies and explores the choreographic transformation "of a recognizable other work or works". For example, ballets like Sleeping Beauty and Romeo and Juliet both are inspired by literary works, Charles Parrault's fairy tale and William Shakespeare’s tragedy respectively. Dance history is filled with examples of dance adaptations and even in the past few decades, numerous very interesting pieces have been created, like Maguy Marin’s May B (1981), Antonio Gades and Carlos Saura’ Carmen (1983), and Wayne McGregor’s Woolf Works (2015). However, the definition of dance adaptation can be widened when thinking of the many dance adaptations of previous dance pieces, like Matthew Bourne’s Swan Lake (1995), to quote one of the most famous examples. It is a fundamental aspect in the field as it deals with dance history in an innovative and at times controversial manner. Again quoting Hutcheon, adaptation is a “repetition without replication” (2006: xvi). Under this label, I will explore various kinds of dance adaptation even beyond the above mentioned definitions, to see what happens when a story or a step or something else gets transmuted and transfigured into another medium or dance style. The approach I will take is mainly cultural historic, with relatively simple but not simplistic language. Linda Hutcheon, A Theory of Adaptation (New York: Routledge, 2006). May B, chor. Maguy Marin, music Franz Schubert, Gilles de Binche, Gavin Bryars, feat. 10 dancers from the Compagnie Maguy Marin, based on Samuel Beckett's work (Angers: Théâtre Municipal d'Angers, 4 November 1981). Romeo and Juliet, chor. Ivo Psota, music Sergei Prokofiev, feat. the Bolshoi Ballet, based on William Shakespeare's Romeo and Juliet (Brno: Mahen Theatre, 30 December 1938). Sleeping Beauty, chor. Marius Petipa, music Peter Ilyich Tchaikovsky, feat. Carlotta Brianza, Pavel Gerdt, Marius Petipa, Enrico Cecchetti and the Imperail Ballet, based on Cahrels Perrault's Sleeping Beauty (St. Petersburg: Mariinsky Theatre, 15 January 1890). Swan Lake, chor. Matthew Bourne, music Peter Ilyich Tchaikovsky, feat. Adam Cooper and the New Adventures Company, based on Marius Petipa, Lev Ivanov and Tchaikovsky' Swan Lake (London: Sadler's Wells, 9 November 1995). Woolf Works, chor. Wayne McGregor, music Max Richter, feat. Alessandra ferri and the Royal ballet, based on Virginia Woolf's three novels, Mrs. Dalloway, Orlando and The Waves (London: Royal Opera House, 11 May 2015). Carmen, dir. Carlos Saura, chor. Antonio Gades, music, Georges Bizet, Paco de Lucia, feat. Antonio Gades, Laura del Sol, Cristina Hoyos, based on Prosper Mérimée's Carmen (Emiliano Piedra, 1983).